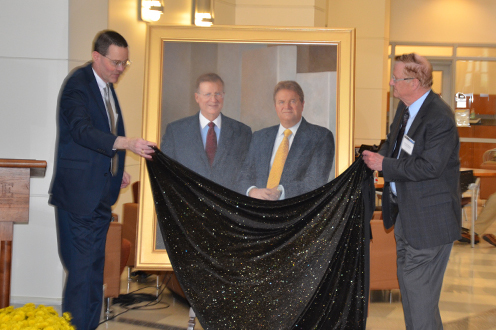 In this digital age, where images are so often fleeting and relegated to storage on the cloud, an enduring portrait of our benefactors, greatest friends, and visionary medical device entrepreneurs is a lasting tribute that will forever be a part of the School’s heritage. Ten years ago Norm and Tom, along with the Weldon family foundation presented the School with a tremendous gift that will have a profound impact for generations to come. This resulted in the naming of the Weldon School of Biomedical Engineering—the first named school in the history of Purdue Engineering. The Weldon family’s impact on the School spans decades. In the early 1970s, Norm advised then Dean of Engineering, John Hancock, to establish a biomedical engineering niche at Purdue. Norm helped recruit Professor Les Geddes to lead it. And 40 years ago, Dr. Geddes arrived on campus with Drs. Tacker, Babbs, and Bourland to launch the biomedical engineering center. And it was Norm who provided Dr. Geddes with one of his first grants that led to the development of automatic implantable defibrillators, which put Purdue on the map in this burgeoning field. It is hard to believe that over 40 years have passed since then, until we consider how much we’ve grown and accomplished. In many ways, the School is like a start-up company and the Weldons have been the quintessential entrepreneurs who have invested in and supported us every step of the way. Today, we are in the midst of an unprecedented and transformational growth phase that will ring in a new era at the Weldon School. Our mission is to be the best, most innovative, and most translational biomedical engineering education and research enterprise this world has ever seen. And we are already well on our way. We are by far the most successful program at Purdue in intellectual property development and the licensing of technologies to our industrial partners. Millions of patients worldwide have directly benefitted from our discoveries. None of this would have happened without the support of the Weldon family. The greatest strength of our School is our people and their entrepreneurial spirit, and Norm, wife Carol, Tom and family are the ideal role models of that proud tradition. 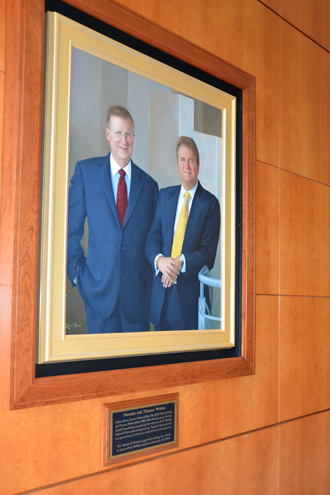 This spirit is what we will think about every time we pass this portrait, just as generations of Boilermakers will do in the many decades to come. 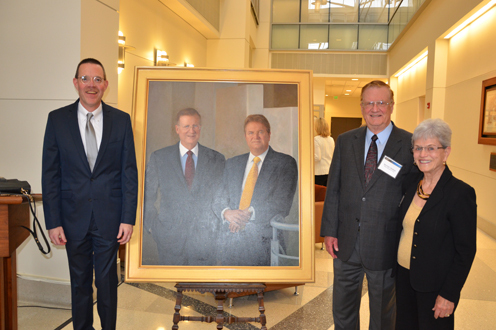 Top right photos: George Wodicka (left) and Norm and Carol Weldon at the portrait unveiling ceremony. 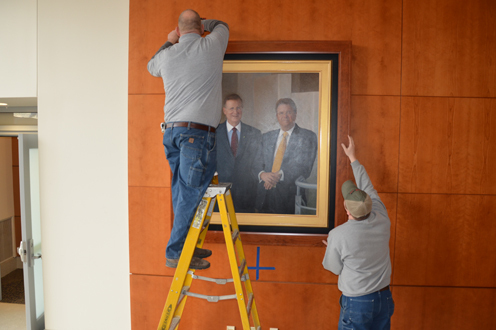 Bottom right photo: The portrait is installed in the Martin C. Jischke Hall of Biomedical Engineering atrium.